Zibotentan (ZD4054) is a specific Endothelin (ET)A antagonist with IC50 of 21 nM, exhibiting no activity at ETB. Phase 3. (E and F) Photomicrograph and quantifications showing reducing in inflammation in steatosis in IL27RA-/-p53H/1 mice treated with ZD4054 (N=9), when compared to sham treated mice (N=7). Chi-square test was used to determine the differences among these two groups. In vivo data with ZD4054 inhibitor was repeated twice with similar results. (i) WT, (ii) IL27RA-/-, (iii) p53H/1, or (iv) IL27RA-/-p53H/1. Dots indicate data from liver of individual mice. Pictures taken at 2003. *P < 0.05. Abbreviation: DAPI, 40,6-diamidino-2-phenylindole. Bosentan is an endothelin (ET) receptor antagonist for ET-A and ET-B with Ki of 4.7 nM and 95 nM, respectively. Macitentan is an orally active, non-peptide, dual ETA/ETB (endothelin) receptor antagonist with IC50 of 0.5 nM/391 nM. Ambrisentan is a highly selective antagonist of the endothelin-1 type A receptor, used in the treatment of pulmonary arterial hypertension (PAH). BQ-123 is a selective endothelin A receptor (ETA) antagonist with IC50 of 7.3 nM. Phase 2. Effects of 0.1% DMSO (as a vehicle), BQ-123 (a selective ETA receptor antagonist), BQ-788 (a selective ETB receptor antagonist), YM-254890 (a selective Gq protein inhibitor), PTX (a selective Gi protein inhibitor) and NF449 (a Gs protein inhibitor) on the ET-1-induced inhibition of insulinstimulated Akt phosphorylation in L6 myotubes. The cells were treated with 30 nM ET-1 for indicated times during treatment with 100 nM insulin for 60 min. The cells were treated with one of the drugs for 30 min (except PTX for 18 h) before treatment with 100 nM insulin for 60 min. (A) Representative immunoblots obtained using antibodies to phospho-Akt at Thr308 [p-Akt (T308)], phospho-Akt at Ser473 [p-Akt (S473)] and total Akt (t-Akt). (B) ET-1-induced changes in the ratio of phosphorylated Akt to t-Akt. 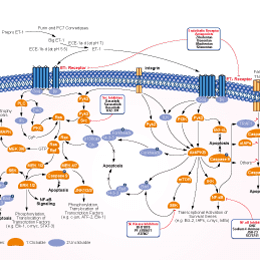 Ordinate represents Akt phosphorylation responses, which are normalized to the level of insulin-stimulated Akt phosphorylation in L6 myotubes without treatment with ET-1, vehicle, antagonists or inhibitors. Data are presented as means ± SEM of the results obtained from five to six experiments. *P < 0.05 versus its control (100 nM insulin alone).